The President [FDR] said that Mr. Churchill was of the opinion that France would be very quickly reconstructed as a strong nation, but he did not personally share this view since he felt that many years of honest labor would be necessary before France would be re-established. He said the first necessity for the French, not only for the Government but the people as well, was to become honest citizens. Marshal [Josef] Stalin agreed and went on to say that he did not propose to have the Allies shed blood to restore Indochina, for example, to the old French colonial rule. He said that the recent events in the Lebanon [where the French ended their mandate] made public service the first step toward the independence of people who had formerly been colonial subjects. He said that in the war against Japan, in his opinion, that in addition to military missions, it was necessary to fight the Japanese in the political sphere as well, particularly in view of the fact that the Japanese had granted the least nominal independence to certain colonial areas. He repeated that France should not get back Indochina and that the French must pay for their criminal collaboration with Germany. The President said he was 100% in agreement with Marshal Stalin and remarked that after 100 years of French rule in Indochina, the inhabitants were worse off than they had been before. . The President continued on the subject of colonial possessions, but he felt it would be better not to discuss the question of India with Mr. Churchill, since the latter had no solution of that question, and merely proposed to defer the entire question to the end of the war. Marshal Stalin agreed that this was a sore spot with the British. Churchill: We must settle the matter of transferring the ships with the Italians, because they are helping us with their fleet. Some Italian ships are fighting, others are patrolling. The submarines are being used for supply. Of course, it is desirable to put the Italian fleet to the best possible use instead of having it against us. That is why I request two months in which to settle with the Italians the question of transferring the Italian ships the Soviet Union. This is a delicate matter and it is necessary to go about it like a cat with a mouse. Churchill: We should like to help the Russian Navy in the Black Sea with our own ships. In addition, we should be happy to help in repairing the Soviet naval base in the Black Sea, for instance, Sevastopol. We should also be happy if the Soviet Government considers it useful to send four or five submarines into the Black Sea to sink the Rumanians and Germans there. I must say that we have neither claims nor interests in the Black Sea. Churchill: That is a big issue. We declared war on Germany because Germany attacked Poland. I was surprised when Chamberlain failed to fight for the Czechs in Munich, but suddenly in April 1939 gave Poland a guarantee. I was surprised when he rejected more favourable opportunities and returned to the policy of war. But at the same time I was also pleased with this fact. For the sake of Poland and in pursuance of our promise we declared war on Germany, although we were not prepared, with the exception of our naval forces, and played a big part in inducing France to enter the war. France has collapsed. But we turned out to be active fighters thanks to our insular position. We attach great importance to the reason for which we entered the war. I understand the historical difference between ours and the Russian standpoint on Poland. But at home we pay a great deal of attention to Poland, for it was the attack on Poland that prompted us to undertake the present effort. I was also very well aware of the Russian position at the start of the war, and considering our weakness at the beginning of the war, and the fact that France went back on the guarantees she gave in Munich, I understand that the Soviet Government could not at the time risk its life in that struggle. But now the situation is different, and I hope that if we are asked why we entered the war we shall reply that it happened because we gave Poland a guarantee. I want to return to my example of the three matches, one of which represents Germany, another Poland, and the third, the Soviet Union. All these three matches must be moved to the West in order to settle one of the main problems facing the allies: to ensure the Soviet Union’s Western borders. Stalin: Yesterday there was no mention of negotiations with the Polish Government. Yesterday it was said that the Polish Government must be directed to do this, and that I must say that Russia, no less than the other Powers, is interested in good relations with Poland, because Poland is Russia’s neighbour. We stand for the restoration and strengthening of Poland. But we draw a line between Poland and the emigre Polish Government in London. We broke off relations with that Government not out of any whim on our part, but because the Polish Government joined Hitler in slandering the Soviet Union. All that was published in the press. What are the guarantees that the emigre Polish Government in London will not do the same thing again? We should like to have a guarantee that the agents of the Polish Government will not kill partisans, that the emigre Polish Government will really call for struggle against the Germans, instead of engaging in machinations. We shall maintain good relations with any Government that calls for active struggle against the Germans. But I am not at all sure that the present emigre Government in London is such as it should be. If it sides with the partisans and if we are given a guarantee that its agents will not have ties with the Germans in Poland, we shall be prepared to start talks with it. Churchill: It would be a good thing now at the round table to hear the views of the Russians on Poland’s borders. I think Eden or I could then make them known to the Poles. We believe that Poland unquestionably should be satisfied at the expense of Germany. We are prepared to tell the Poles that this is a good plan, and that they cannot expect a better one. After this we could raise the question of restoring relations. But I should like to emphasise that we want a strong independent Poland, friendly to Russia. Roosevelt: I should like us to have a picture of the whole before we speak of the separate components. In my opinion, Prussia must be weakened as far as possible, and reduced in size. Prussia should constitute the first independent part of Germany. 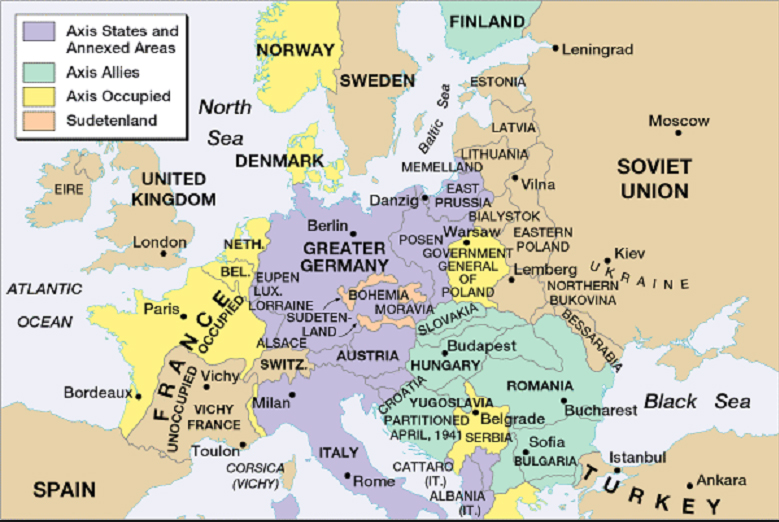 The second part of Germany should include Hannover and the north-western regions of Germany. The third part — Saxony and the Leipzig area. The fourth part — Hessen Province, Darmstadt, Kassel and the areas to the south of the Rhine, and also the old towns of Westphalia. The fifth part — Bavaria, Baden, Württemberg. Each of these five parts would be an independent state. In addition, the regions of the Kiel Canal and Hamburg should be separated from Germany. These regions would be administered by the United Nations, or the four Powers. The Ruhr and the Saar must be placed either under the control of the United Nations or under the trusteeship of the whole of Europe. That is my proposal. I must add that it is merely exploratory. Churchill: You have said a mouthful. I think there are two questions: one — destructive, the other — constructive. I have two ideas: the first is to isolate Prussia from the rest of Germany; the second is to separate Germany’s southern provinces — Bavaria, Baden, Württemberg, the Palatinate, from the Saar to Saxony inclusive. I would keep Prussia in strict condition. I think it would be easy to sever the southern provinces from Prussia and include them in a Danubian federation. The people who live in the Danube basin are not the cause of war. At any rate, I would give the Prussians harsher treatment than the other Germans. The southern Germans will not start a new war. Stalin: I do not like the plan for new associations of states. If it is decided to partition Germany no new associations need be set up. Whether it is five or six states, and two regions into which Roosevelt proposes to divide Germany, this plan of Roosevelt’s to weaken Germany can be examined. Like us, Churchill will soon have to deal with great masses of Germans. Churchill will then see that it is not only the Prussians who are fighting in the German Army but also Germans from the other provinces of Germany. Only the Austrians, when surrendering, shout “I’m Austrian”, and our soldiers accept them. As for the Germans from Germany’s other provinces they fight with equal doggedness. Regardless of how we approach the partitioning of Germany there is no need to set up some new association of Danubian states lacking vitality. Hungary and Austria must exist separately. Austria existed as a separate state until it was seized. Stalin: There are no steps that could exclude the possibility of Germany’s unification. Stalin: Europe has nothing to do with it. I don’t know that there is need to set up four, five or six independent German states. This question must be discussed. Stalin: The Russians have no ice-free ports on the Baltic. That is why the Russians would need the ice-free ports of Königsberg and Memel and the corresponding part of the territory of Eastern Prussia, particularly since these are age-old Slav lands. If the British agree to the transfer of the said territory to us, we shall agree to the formula proposed by Churchill.